The National Flood Insurance Program (NFIP) is the sole source of flood insurance for most businesses and homeowners in the United States. Devastating floods were a recurrent problem throughout much of the twentieth century. In 1936 Congress attempted to address the issue by enacting the Flood Control Act. This law authorized the federal government to build flood-control structures like dams and levees. Unfortunately, these measures were insufficient and the flooding continued. By the late 1960s floods had become very costly. They were causing massive property losses and necessitating huge outlays of federal funds in disaster relief. Congress realized that a comprehensive flood prevention program was needed. To that end, it created the National Flood Insurance Program (NFIP) in 1968. The NFIP is administered by the Federal Emergency Management Agency (FEMA). The program is designed to reduce flood losses using a three-pronged approach: floodplain management, flood hazard mapping, and flood insurance. The term floodplain simply means an area prone to flooding. One of the pillars of the NFIP is community involvement. Participation in the program is voluntary. Communities that do take part make a commitment to the federal government. They promise to initiate and enforce a floodplain management program. Floodplain management can be accomplished by various means including zoning and building code enforcement. Communities that participate in the NFIP must limit new construction in food-prone areas. They must also ensure that new structures are properly elevated. If a community fulfills its end of the bargain under the NFIP, property owners in that community will have access to flood insurance. When a community first joins the flood program FEMA conducts a study of the area's flood risks. When the study is completed FEMA prepares a Flood Insurance Rate Map (FIRM). The map is a visual representation of the community's flood risks. These may include creeks, rivers, levees, dams and floodways (areas where water flows during a flood). To assess flood risks FEMA uses a standard called the base flood or 100-year flood. A 100-year flood is expected to occur at least once every 100 years (it may occur more frequently). A base flood has a 1% chance of occurring in any given year. Under the NFIP a 1% flood zone is called a special flood hazard area (SFHA). When drawing a FIRM, FEMA uses a coding system to designate SFHAs. Areas located along a coastline are assigned the letter "V." "V" zones are particularly risky because they are vulnerable to damage by high-velocity waves from storms or tsunamis. Areas prone to flooding but not wave action are designated by the letter "A." "A" zones may be located near a lake or river. They may also be situated near the coast in a location protected from waves. Another feature included in a flood map is the base flood elevation. This term means the elevation to which floodwater is expected to rise during a base flood. To be protected from a flood, property must be situated above the BFE. To a property owner, a 1% risk of flood may seem low. In a 1% floodplain, however, there is a 26% chance that a flood will occur during any 30-year period (the life of a typical mortgage). 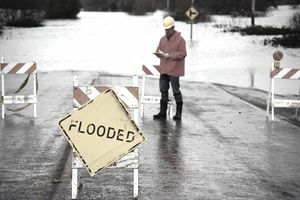 Thus, any property located in an SFHA must be covered by flood insurance if the property is mortgaged through a lender that is federally regulated or insured. Owners of property that is not in an SFHA may purchase flood insurance voluntarily. Flood insurance must be purchased separately from commercial property insurance. This is because flood and related perils (like storm surge, mudflow and sewer backup) are excluded under a commercial property policy via the water exclusion. Flood insurance cannot be purchased directly from FEMA. Rather, it is available from insurance companies that have engaged in a contractual arrangement with the NFIP. These insurers issue and service flood policies on FEMA's behalf. Insurance buyers can purchase flood insurance from one of these insurers through an insurance agent.